The answer, as so often seems to be the case, is "pay Verizon some money." The wireless company announced the launch of "FreeBee Data" today, a service that allows advertisers and other third-party companies to pay Verizon and allow subscribers to access high-data web content for free. (There's a bee in the logo. Because it's a "FreeBee." Sigh.) Partners can sign up to have some or all of their content, delivered either by an app or a specific web domain, not count against Verizon postpaid customers' data limits. Partner companies can pay for data by the gigabyte, or alternately, pay on a per-click basis for specific content that they deliver. The FreeBee Data logo. It's a bee. The system will start in beta on January 25th, with initial partnerships from Hearst, AOL, and Gameday, but at the moment it's only going to be tested on 1000 Verizon subscribers. Presumably the biggest challenge with the entire concept will be 1) communicating to customers the fact that they can consume certain content without eating into their data allotment and then 2) convincing customers to actually consume said content, which will almost certainly be an advertisement or promotional app 90% of the time. Customers will see a the bee logo above next to links and videos, letting them know that this particular content can be gobbled up for free. Presumably this will only work on Verizon phones in conjunction with some software running locally. And all that's before net neutrality watchdogs sink their teeth into FreeBee Data. If T-Mobile catches bad publicity for giving its customers free data for music and video services, I can't imagine Verizon collecting money from advertisers for preferential treatment will be an easy pill to swallow. NEW YORK – Consumers will gain greater flexibility when streaming or downloading content on their mobile devices with the introduction of FreeBee Data – the new sponsored data service by Verizon. FreeBee Data will help businesses drive better engagement with mobile content on America’s largest and most reliable 4G LTE network. The FreeBee Data service has two models. With FreeBee Data 360, content providers can sign up to provide consumers some or all of their mobile content – whether in an app or mobile website – without using consumers’ data plans. FreeBee Data 360 is billed using a per gigabyte pricing model. Through a separate FreeBee Data offering, content providers can sponsor specific consumer actions on a per-click basis, free of data charges for subscribers – including mobile video clips, audio streaming, and app downloads. Learn more about the complete set of FreeBee Data offerings. FreeBee Data 360 is commercially available on a beta basis starting today. Interested content providers can use this service to sponsor data for all of Verizon’s post-paid customers. On January 25, Verizon will begin a beta trial of the separate pay-per-click service. Brands already signed up to participate in the pay-per-click trial include Hearst Magazines, AOL and GAMEDAY. These content providers will sponsor some mobile content for 1,000 test subscribers. Other brands are welcome to participate in the trial. Commercial availability of the pay-per-click service is expected later this year. Participating brands and content providers to build smarter mobile marketing campaigns targeted to Verizon Wireless subscribers using either pay-per-click or pay-per-gigabyte pricing. FreeBee Data and FreeBee Data 360 are open to any content provider, including mobile advertisers and others who want to take their mobile-first experience to the next level. Consumers to get great content from participating brands and content providers without using their data plans. 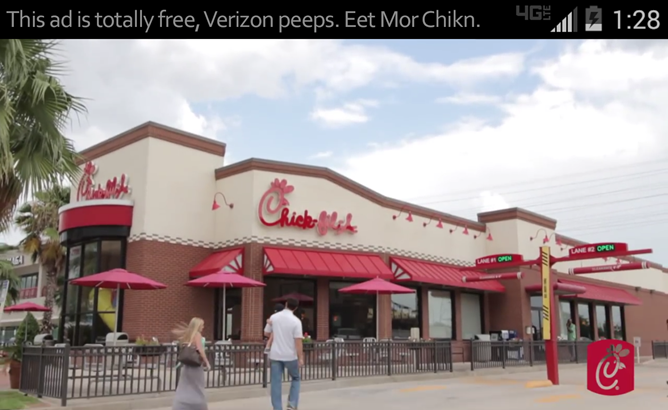 For pay-per-click campaigns, the FreeBee Data icon (a “bee”) appears next to sponsored content to let Verizon Wireless subscribers know that, when they click on that content, they will not incur data charges. With FreeBee Data 360, businesses can sponsor some or all of their app or website.